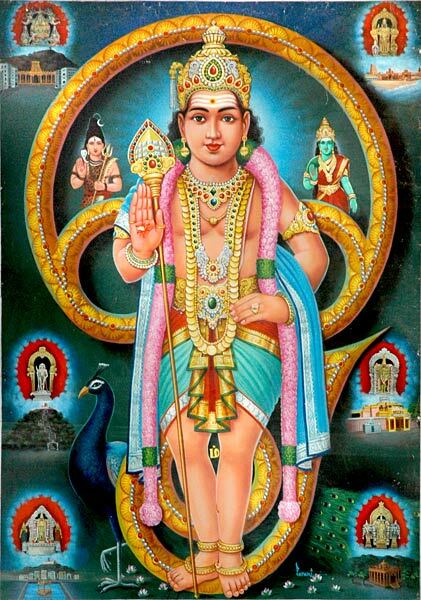 Lord Muruga is the prominent God of Hindu people. He is adorned and celebrated mostly in Tamil Nadu and called as God of Tamilians. He is the younger son of Lord Shiva and Lordess Shakthi. In 1960s and 1970s there were many films telling the story and pride of this god released in various parts of Tamil Nadu. Some of the movies contained evergreen devotional songs of Lord Muruga. Those songs are popular even today among Tamilians. The true devotees of Lord will get excited on hearing and viewing those devotional video songs. Knthan Karunai, Devarin Deivam and Varuvan Vadivelan are some of the popular Lord Muruga's devotional movies released at that time. In the above song Lordess Shakthi, the mother of Lord Muruga sings the pride her son. She sings that Lord Muruga means beauty and chanting his name will give pleasure to anyone's mind. The old actress Shavithri took the role of Lordess Shakthi and it is present in old Tamil devotional movie 'Kanthan Karunai'. The song was beautifully shot as Lord Shiva is worshipping His son Lord Muruga to learn the secret of pranav mantra 'Om'. This song is the most popular one in which Great Tamil poet Nakkeerar and Lord Muruga took part. Nakkeerar is one who composed the literary work called Thirumurugartupadai. In this song the saint poet sings about all the six abodes of Lord such as Thiruparankundram, Palani, Thiruchendur, Thiruthani, Swamimalai, Palamuthircholai situated in various parts of Tamil Nadu. Each devotee of Lord Muruga will get excited on seeing this beautiful song. The other great thing is that we can see all the six abodes of Lord Muruga in this song. Dr. Seerkazhi Govindarajan (late), popular playback singer at that time, acted as Nakkeerar and Kalai Mamani Dr. Shiva Kumar, the senior actor of tamil film industry took the role of Lord Muruga. Kalai Mamani Shiva Kumar looked so smart and handsome and he was 100% opt to the role of Lord Muruga. The song is present in the movie 'Kanthan Karunai'. Lordess Devayani and Lordess Valli are the two consorts of the Lord. In the above song they both are singing the fame of their swami Lord Muruga. The senior actress KR Vijaya took the role of Shri Devayani and other great actress J Jeyalalitha (former CM of Tamil Nadu) took the role of Shri Valli. This song is also from the film 'Kanthan Karunai' Both actresses have performed their role very nice. The six abodes of Lord Muruga are located in different parts of Tamil Nadu. Each abode of Lord Muruga has its own story and importance. The above song is from the film 'Devarin Deivam' and was shot in one of the popular abodes of Lord, Palani in Tamil Nadu. In this song we could see the abhishekam of God by various holy things like viboodhi, rose water, panchamirtham, chandan and curd. There is an interesting story about the Lord Palani Murugan. In this song we will be able to see many devotees performing the rituals like kavadi. The shrine of Lord Muruga is located on the top of the rock highing about 120 m above ground level. The song was shot in the popular shrine of Lord Muruga located at Batu Cave in Malaysia. This video song is present in popular tamil movie Varuvan Vadivelan. We can see in this song a huge mass of devotees performing various religious activities like carrying kavadies on their shoulders, breaking coconuts and climbing on 272 steps laid infront of the temple. Every year on Thaipusam grand festival is celebrated here. The song became so popular during that period and other great plus of the song is that it was sung by the famous tamil playback singer and musician Shri MS Viswanathan and the lyrics were written by Kaviyarasar Kannadasan.